For my second blog post this month I have made two very different projects for me. The first is this pocket page layout. 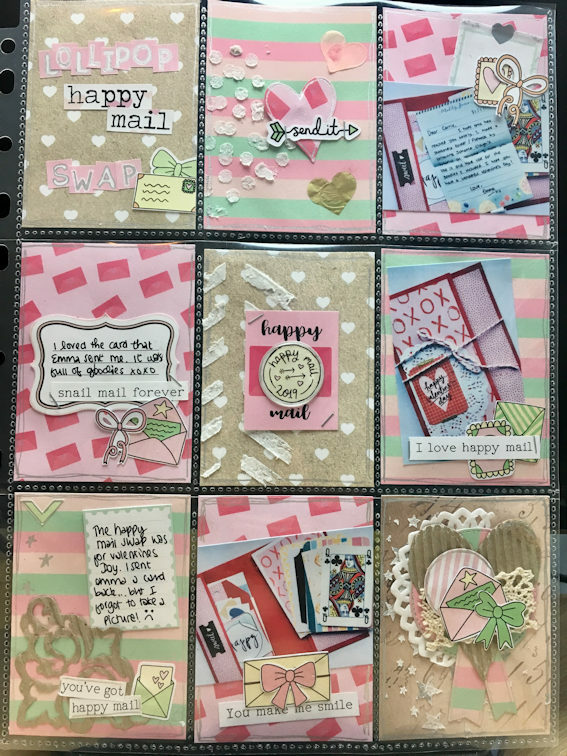 As the box this month was themed around Happy Mail, it was the perfect thing to use to document about the gorgeous Valentines mail that I received from the very talented Emma for our Lollipop box Valentines Day swap. 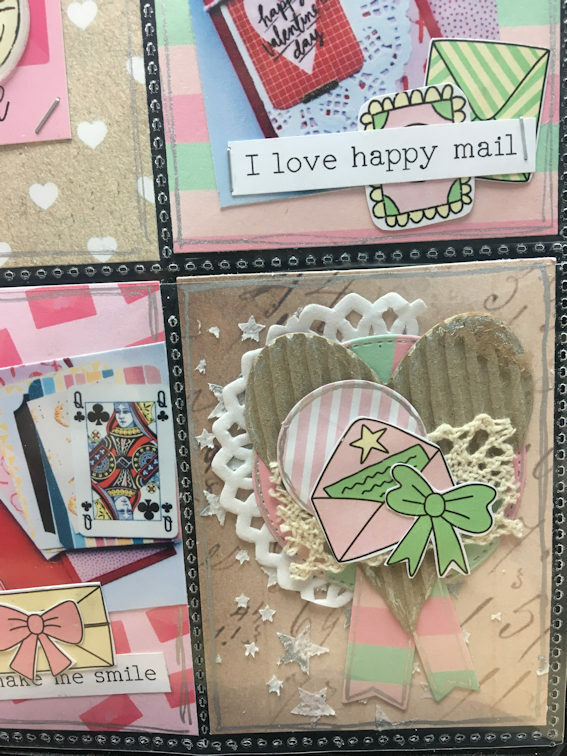 I used the patterned paper from the kit to cut the card shapes for each pocket and then added some texture paste over the arrow stencil that was an add on in the shop on one of the cards and some stars and circles onto the others. I then used my die cutting machine to cut some shapes, using the box that the kit arrived in and more of the yummy papers. I used the box on all my layouts this month, you really can use the whole kit, including the packaging. By pulling the top layer off the box you reveal the corrugated inside which adds yummy texture to the page. I made a rosette from die cuts of paper and card and some of the doily and lace and then decorated it with the ephemera pieces. I created a title from the alphas that were a new addition to the boxes this month. And stuck some of the confetti onto the cards. 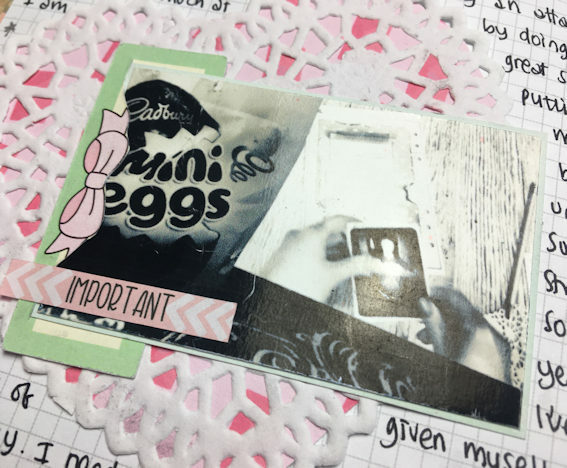 I haven’t been pocket page scrapbooking for very long, but I really love this way of memory keeping. I store all my layouts – 12×12, 8.5×11 and pocket pages in the same albums. I also created a page in my new Travellers Notebook. I have decided that I am going to use this more as a diary/journal. Somewhere to talk about things that are perhaps not as nice or things that are hard. We often struggle to document these things, maybe we are trying to put a brave face on about them or don’t like to be reminded of those times, but actually documenting and journaling and getting things out can be really therapeutic. I haven’t been too well recently, a long term illness has flared up after a spell of being a good bit better and its been tough. 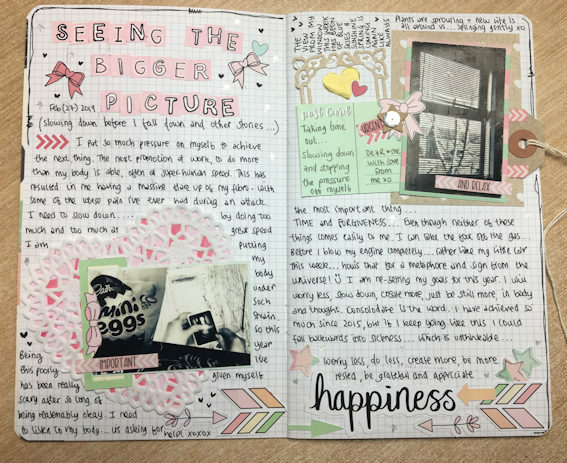 I have used my notebook to document this, as its usually less on show than my scrapbooks would be….this time being the exception when I am sharing it with you all)! I used lots of the lovely embellishments on this page. I started off by deciding where to have my pictures and then built the layout around that. Adding the ephemera and the doily behind the bottom left picture and the little tag at the top right. Once the main elements are in place its easier to see where you have left to journal around. I hope you have enjoyed my slightly different pages this post. 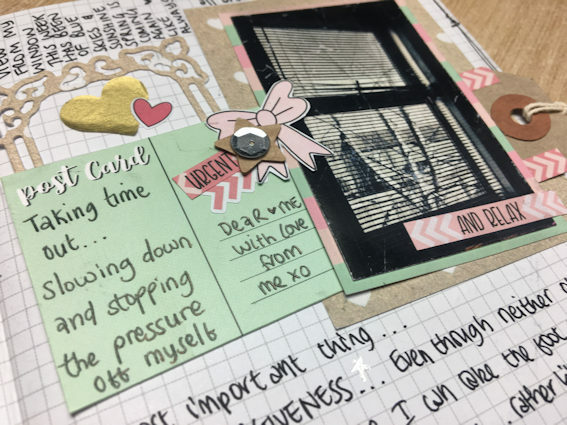 Speak to you all in April – when I will be using the gorgeous ‘Planner Girl’ kit to create some more mixed media layouts. The new March kit ships on Monday. You can still buy one here.